IMACULATE! ** 1 OWNER ** LIMITED ** NAVIGATION ** 20 INCH PREMIUM WHEELS ** LEATHER INTERIOR ** SUNROOF ** BLUETOOTH ** CD PLAYER ** HEATER SEATS ** 7 SEAT PASSENGER ** CLEAN TITLE ** PREMIUM JBL SOUND. 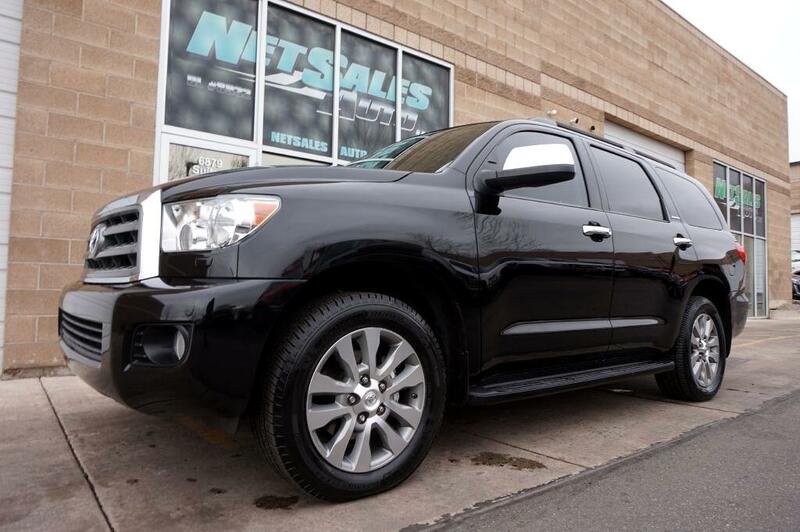 2015 TOYOTA SEQUOIA LIMITED. This vehicle is fully loaded with all the options available for it. It comes with a powerful 5.7L I-FORCE V8 engine able to pull any of your favorite toys! it's a 7 seat vehicle with plenty of leg-room for each passenger. Automatic third-row seat folding with control buttons on the front and rear for easy access. All your power options, heated leather seats and premium JBL sound just to name a few. This is an immaculate SUV that has been well maintained and garage kept. You will not find a nicer used one out there. Call or text Justin at 801.787.5993 or call our office at 801.255.5343 with any questions or to schedule an appointment. STRESS FREE NO HAGGLE UNBEATABLE PRICING FOR FAST AND EASY TRANSACTIONS. WE ARE AN INTERNET DEALERSHIP, so Appointments are STRONGLY encouraged as we are not a traditional car lot this gives us enough time to pull the vehicles out. When you come, we allow you to fall in love with our vehicles in a none high pressure, stress-free environment. We are Net Sales Auto, located at 6879 south 700 west suite #7 Midvale, Utah. We try to represent our vehicles as clearly as possible, please understand they are used and some wear and tear can be expected. EXTENDED WARRANTIES ARE AVAILABLE FOR PURCHASE. Trades welcome! Se Habla Espanol. We also offer financing through banks and credit unions for your convenience with rates as low as 3.99% O.A.C. See more great deals at NETSALESAUTO.COM Come see our Clean Inventory of Cars, Trucks , Vans and Sport Utility Vehicles all at Unbeatable Prices. We assure our Customers a none high-pressure, worry free buying experience with Vehicle history reports available showing Clean Title's . If we do not have what you are looking for we will get it! Our inventory is changing daily so please call to make sure its still available.Thanks for considering NETSALESAUTO.COM Where you will find the best prices on the NET!! WE BUY CARS! Information deemed reliable, but not guaranteed. Interested parties should confirm all data before relying on it to make a purchase decision. All prices and specifications are subject to change without notice. Prices may not include additional fees such as government fees and taxes, title and registration fees, finance charges, dealer document preparation fees, processing fees and emission testing and compliance charges. Internet special price may not be compatible with dealer sponsored or subsidized subprime financing. We offer the finest quality Pre-Owned vehicles at ETHICAL / UNBEATABLE prices!! A CarFax history report is available on all cars in stock. Trade-ins are always welcome. We have great financing options available. ! While every attempt has been made to ensure the accuracy of the data displayed, the dealership is not responsible for any errors or omissions and prices, options, warranties, are always subject to change. *See dealer for complete details on limited warranty, extended warranties, exchange policy and shipping information. Message: Thought you might be interested in this 2015 Toyota Sequoia.